The second Tuesday of every month is always Puzzled Pint day! The Pint has been growing around the world and this month there are set to be thirty meetings around the planet, from New Zealand to Europe to the west coast of North America. 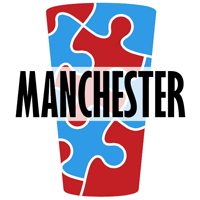 For the first time, this includes two meetings in different UK cities; London is well into its third year of Puzzled Pint and now Manchester is diving in. As you can see, London’s shades of red and blue are roundel-inspired, whereas Manchester takes its hues from football colours. There’s no reason why other UK cities couldn’t host their own versions; it just needs someone to take responsibility for doing so. 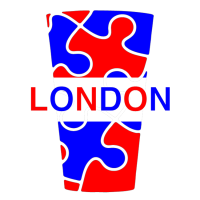 The simplest way to think of Puzzled Pint is to imagine a pub quiz that you solve with a team of your friends, but replace the quiz questions with puzzles: all sorts of puzzles – word puzzles, picture puzzles, maybe codes, perhaps maths or logic puzzles – and usually very good ones. The atmosphere is deliberately very accessible and hints are freely available, so everyone, from first-timers onwards, can have the fun of surprising themselves by solving puzzles that they thought they would never be able to solve. It’s probably more fun if you come with a group, but if you come alone then the organisers will help you find a team and hopefully make new friends. There’s no charge for taking part! The nominal timing of the event is 7pm to 10pm, but there’s some flexibility – and your team’s timing only starts when you get the puzzles, no matter what time you turn up. Please bring a pair of scissors if you can.